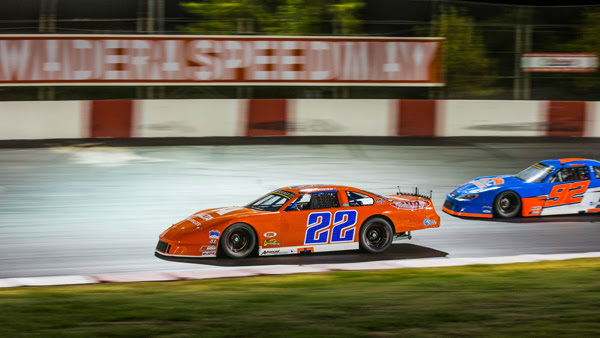 MADERA, CALIFORNIA (September 20, 2017) – Madera Speedway’s MAVTV-televised Late Model championships are nearing the finishline with Round #7 of eight set for this Saturday night. RPM Mortgage Pro Late Models race for $2,000 to win and 100 laps along with 51FIFTY Energy Drink Jr. Late Models for 75 laps. Toyota Sedans and Modified Super Toyotas will also be competing on the fastest one-third mile in the west. Bakersfield’s Buddy Shepherd holds a narrow one point lead in the RPM Mortgage Pro Late Models despite missing the August race. His closest rival, Napa’s Logan Zampa, scored a fast-time and a fifth place finish on August 26th in round #6. The duo have four wins and six fast-times between them. The only other winners this year were Matt Erickson in the $5,000 to win season opener in March and August winner Jeremy Doss of Upperlake, CA. 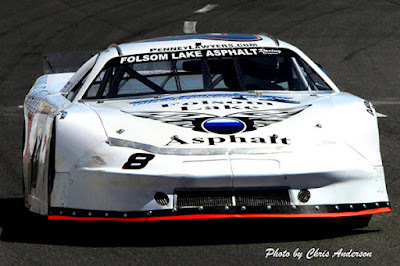 Erickson is the winningest driver in Madera Late Model history and recently won the track’s non-televised Madera Late Model championship. Doss is the winningest driver in the touring PCS Super Late Model series. While the gap between Zampa and Shepherd is only one marker, Dillon Tucker is not far behind with only 29 points in arrears of first. Modesto’s Garland Tyler and Erickson round out a top-five all separated by just 36 points. Any of the five are still very much mathematically in the hunt for the series championship. Saturday’s race is expected to draw a large turnout as the final tuneup before October 7th and the $10,000 to win Short Track Shootout. The Short Track Shootout also serves as the championship race for the division. Jesse Love IV of Menlo Park scored his fourth win of the year in the 51FIFTY Jr. Late Models in August and is riding that wave into Saturday’s 75 lapper. If Love can win, he’d tie Austin Herzog with five career wins in the series for drivers ages 10-16. Love leads the points and paced his teammate Adam Lemke of Hollister across the stripe last month. Redwood Valley’s Kolby Berry has set fast-time in five of the six races but is still in search of his first victory. He will work on visiting victory lane coming from second in the points. 12 year-old Austin Edwards of Mentone has worked his way up to third, just ten points ahead of Las Vegas’ Kyle Keller. Hailie Deegan missed the last event but is expected for the final two races as a tune-up for bigger plans in 2018. Deegan is also winless but has two podiums good enough for fifth in the points. She is closely followed by Jesse Burks who finished a career-best third in August. Bert Stephens leads the Modified Super Toyota points with ten top-two finishes. Mike Marley has led the Toyota Sedan points for most of the year and has eight top-two finishes including a streak of four in a row. Both divisions will run 25 lap main events this weekend. An open practice kicks off the weekend on Friday before a full day of action on Saturday. Friday practice runs from 5 p.m. - 8 p.m. On Saturday, pit gates open at 11:30 a.m. with practice from 2 p.m. - 3:30 p.m. Qualifying will follow with B Mains and Heat Races beginning at 5:15 p.m. Opening ceremonies and main events will follow at approx. 6 p.m.
Eureka, CA (September 17, 2017) – Redwood Acres Raceway hosted the sixth and final outlaw kart race of the 2017 Saturday night. As always, the drivers in all four kart divisions provided exciting racing on the 1/10-mile dirt oval. Wyatt Burns set quick time in the beginner box stock division with a 10.437. Charles French won the four-lap trophy dash while Burns took home the main event victory. The 20-lap main event was an absolute runaway for Burns as he took the lead from the drop of the green and never looked back. Only a late caution in the race prevented Burns from lapping the entire field. Burns’ margin of victory over second place Seth Grammar at the finish was over 10 seconds. French was the first car a lap down in third while Aaliyah Uselton and Corbin Green rounded out the top 10 finishers. In the Williamson Financial Group box stocks, Dryver Dothage set fast time with a lap of 9.530. Tater Reich took trophy dash honors while the heat race victories were claimed by Kadence Mace and Reich. Derrick Kessler jumped to the race lead on lap one of the 20-lap main event. On lap five, the two fastest drivers were Dothage and Reich as they moved into the first and second divisions. After chasing Dothage for most of the race, Reich was able to get by for the lead on lap 14. A caution with two laps remaining in the race proved to be the turning point in the race. Under the yellow, Reich’s engine quit as officials lined up the field. Per the rules, Reich had to restart in the rear of the field which gave Dothage the lead. At the checkered flag, Dothage’s lead was almost two and a half seconds over the second place finisher who was Kessler. Reich made a late charge to place third with Jayden Molloy fourth and Dylan Combest fifth. If was Jeff Smith’s night in the speedway/old fart kart class. He set fast time with a 10.514 and was able to sweep the trophy dash, heat race and main event on the night. The 250 karts were paced in qualifying by Landen Green. Green’s lap was a 9.277. He would go on to win the trophy dash and heat race. Green appeared to be the favorite in the 30-lap main event but issues on lap seven took him out of the race. Maleesa Miles inherited the lead and would go on to take the 250 victory. MKinzy Uselton placed second while Green was credited with third. Daniel Whitley’s time of 8.727 was just enough to earn him quick time for the 500/open karts. Whitley took home the trophy for the dash while Brad Curtice was victorious in the heat race. Tony Miles initially held the lead in the main event before giving way to Curtice on lap two. Curtice led until lap 11 when Daniel Whitley took over. Whitley had his car dialed in and was able to run away to a four second victory. Curtice placed second while Kyle Whitley, Miles and Dax Williamson completed the top five.